Concrete Mixer Rental – Stone 25CM Concrete Mixer, is available for rent from the Duke Company in Rochester NY, Ithaca NY and the entire Western New York region. 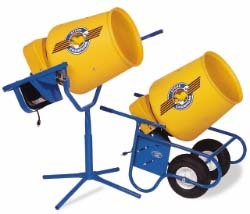 For small projects – whether on the job site, farm or home, the 25 CM Concrete Mixer accomodates batches of 2 cubic feet. 1/3 horsepower motor (electric).